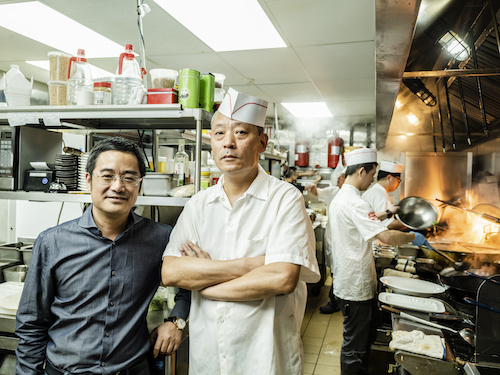 More than a restaurant with quality food and ingredients, Alley 41 is something of a dream come true for its owner Yao Hua, who came to the United States in 1999 from Sichuan Province. 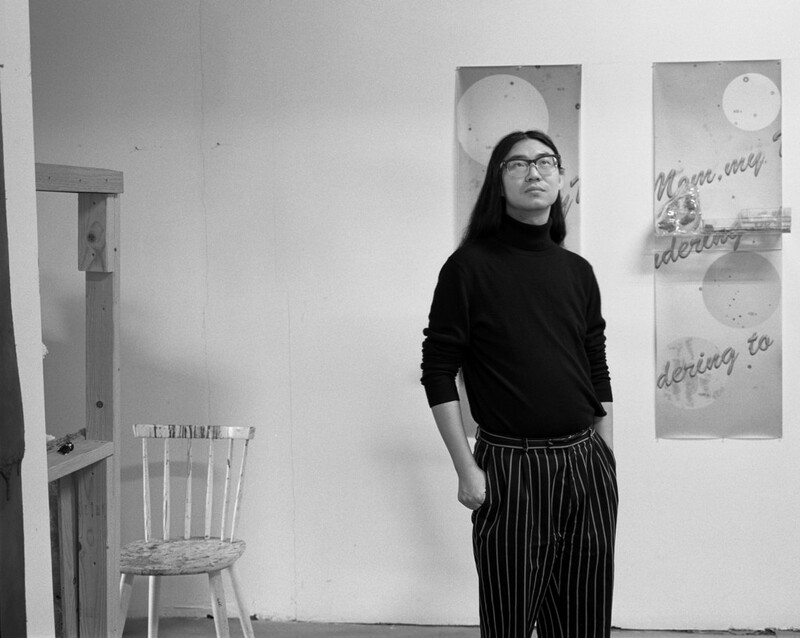 What Mr. Yao left behind and longed for were the senses of his youth, the alleyways that were always full of color, texture, sound, smell, and flavor. Having worked in restaurants since coming to the city, he finally decided to take the leap and made sure those senses were taken care of expertly in his new place. A talented area designer was hired to recreate the feelings one would have walking down an alley in Chengdu, the capital of Sichuan Province. The materials and design inside force you to constantly search around corners in order to see the next spaces, never quite getting a sense of the whole restaurant. Each part of the “alley” has an importance of its own, and plays with a different sense. Indeed, a first time visitor progressing towards the back of Alley 41 (The Chinese name of the restaurant translates simply to “Sichuan Alley”) will have only passing glimpses of the bounties to be found on each table. The metal and glass screens create spaces that make you want to stop and pause to interact with the joyous guests in each, making sure to include their tempting plates into orders later. Mr. Yao and Chef You. Photo by Sasha Maslov for The Queens Tribune. 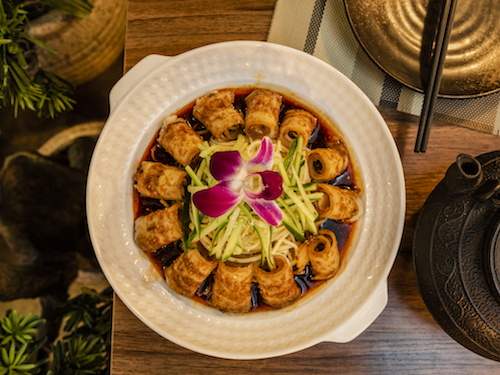 These beautiful dishes are made possible by head chef You Xiao Bin and a kitchen that imports over 80 percent of its ingredients from Sichuan Province. In that part of China, the Chengdu Plain is known for providing fertility and is one of the primary sources of food for the entire country, given the nickname “The Land of Abundance.” With over 40 years experience in Chinese kitchens, Chef You worked with a renowned Sichuan master back home and had a successful career long before joining the team here in Flushing. Sliced pork belly in garlic sauce. Photo by Sasha Maslov for The Queens Tribune. The menu reads like an all-star team of Sichuan food, all the classics executed with true heart and passion. The leadoff hitter of this team is the sliced pork belly in garlic sauce(above), a cold appetizer which seems to be on almost every table. Thin slices of the fatty pork are covered with a peppery garlic sauce and can be eaten on their own or rolled with the accompanying noodles and cucumbers. 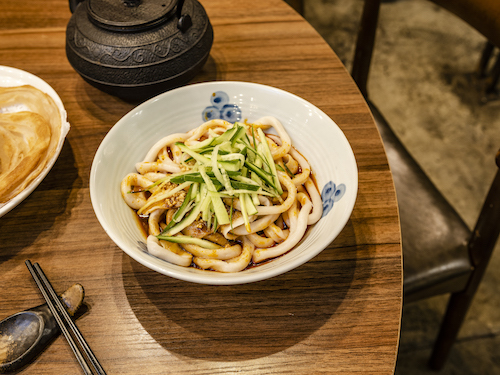 This and other cold appetizer dishes are served first before portions of the thousand layer pancakes and buckwheat noodles with spicy sour sauce (below). Even a group of ten will not be bombarded with too many dishes at the same time, the food comes out a good pace and the timing seems well thought out. Other well-known options like mapo tofu and Chongqing chicken (here known as “Geleshan,” a neighborhood of Chongqing that is a particularly popular place to eat the spicy fried chicken and pepper dish), are done flawlessly, if not super high on the heat charts. 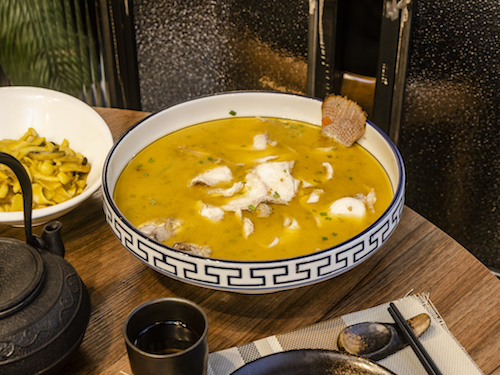 The texture and complexity of Sichuan food is the focus at Alley 41 rather than burning your mouth, but a simple request to the kitchen to amp it up is probably well within the rules. Buckwheat noodles with spicy sour sauce. Photo by Sasha Maslov for The Queens Tribune. While dishes like the Dongpo pork belly sticky rice, sizzling beef with black pepper, and double cooked pork belly are worthy options in the context of a large meal, the kitchen really starts to fly with fish dishes and stews. The boiled sliced fish in hot chili sauce is presented in what looks to be simply a bowl of fiery red peppers. Dig inside to find filets of not so spicy white fish and enjoy one of the best items on the menu, but do not pass up the opportunity to eat the braised whole fish that comes drowned in a puddle of sweet and spice. On a follow-up visit, Mr. Yao wanted us to try the sliced fish with spicy peppers and chives (below), which will make its debut on the menu soon. While many Sichuan dishes are glowing red from the use of that color pepper, this stew is yellow with an intense heat that hits you as a surprise. Hopefully this takes its place with a permanent spot in the kitchen, it is a delight. Sliced fish with spicy peppers and chives. Photo by Sasha Maslov for The Queens Tribune. Possibly one of the best ways to experience a meal here is with as large a group as you can round up. They have private rooms for big parties in the back and downstairs, big enough for the large table in the middle and easy circulation around. It gives you the opportunity to meander through the space and the other tables as prescribed above while offering the best way to order as much of the menu as physically possible. 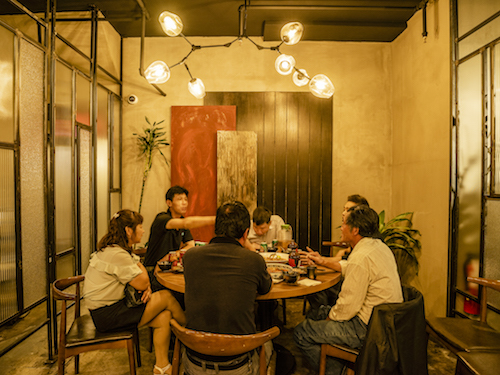 After enjoying company and food in the relaxed setting, you can walk back through the space to exit, gathering ideas for the next meal and exiting back onto the street satisfied. Consistent with the theme of a Sichuan alley, Alley 41 is located on 41st Avenue, well removed from the hustle of Flushing’s main thoroughfares. Almost hidden, but with the intention of being that way. Despite this nature, word of mouth has made it a success and the constant crowds tell a very different story.